NEW YORK, April 20, 2006 -- Gazing down at the infinitely tragic footprints of the pulverized Twin Towers, major American Architects and members of the Municipal Art Society of New York had at least one Ground Zero success to celebrate recently: 7 World Trade Center! Although the prize-winners, fellow-architects & developers, and Muni Arts members were only in the middle-range of floors in this sleek new glass-clad high-rise, the views down below, downtown, across the Hudson, and toward the East River are all striking. What they will be like from the top floors—not yet accessible to the public—should be fabulous. The downtown side of the 25th floor had been outfitted to give potential tenants an idea of how their suites of offices might look. The other three sides of the glass-walled, unfinished, wide open-space—around the central core of elevators, stairs, and services—also promised unparalleled views, as well as entire floors unobstructed by columns or other supports. At the entrance to the awards-area, photographs of the prize-winners were displayed on easels. 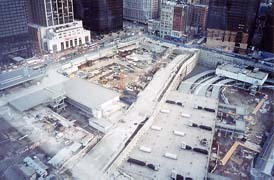 Inside the furnished-area, there was a model of the Downtown Area, centered on Ground Zero, with models of what may one day rise alongside Number 7. Chairman of the Awards Committee, Michael Arad—designer of the World Trade Center Memorial—spoke of the projects & plans underway. But several of the distinguished guests, looking at the forlorn wasteland below—with the subway-loop exposed—wondered aloud why it was taking so long to begin construction in the architectural void. 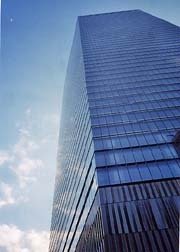 That neither Governor Pataki nor Mayor Bloomberg seem to be able, thus far, to "make things happen," and that Larry Silverstein—the lease-holder & developer of the blasted site—has legal & legitimate concerns, is understood by everyone who is interested in creating an Architectural Phoenix—or two—rising from the literal ashes of the World Trade Center. But who can really make this happen? And, finally, when? What no one wants at Ground Zero is an Architectural Eyesore—or some High-Rise White-Elephants. Not to forget that Old Folk Wisdom: "People who live in glass-houses shouldn’t throw stones." Curiously, unless you know your way around Ground Zero, you might miss Number 7. It has, as yet, no Major Signage outside, except for a strange kind of sculpture of thin metal-plates on its cladding that suggests a Seven, if you look at it from far enough away. Your scribe/photographer was standing almost beneath it, unable to see it, until a doorman pointed it out. One of the visual amenities of Number 7 is a long, low, free-standing wall, behind the reception-desk, that features a Jenny Holzer running-text in bright white lights. This streams from right to left, possibly to confound future Arab Terrorists, who read Arabic cursive-script or print in the opposite direction. In addition to the award for Number 7—Skidmore, Owings & Merrill, architects and Tishman Construction Corp. for developer Larry Silverstein—awards were also made in four other categories. Two of these were in the Downtown Area, as well. The award for Best Privately-Owned Public-Space went to the handsome shining glass-box at 55 Water Street, designed by Roger Marvel Architects, with credits also to Ken Smith Landscape Architects. Best Residential Restoration Award was given to Historic Front Street, South Street Seaport, Cook + Fox Architects. In the language of the award, this is a residential building "whose recent restoration captures the original qualities and complements the surrounding area." Awards judges included Aby Rosen, President of RFR Holding LLC; Christopher Sharples, Partner, Sharples, Holden Pasquarelli, and Annabelle Selldorf, Founding Partner of Selldorf Architects. This panel also gave an award to The Top of the Rock, at Rockefeller Center, for the Outstanding Commercial Restoration Project. In the long roster of credits, the architects, Gabellini Sheppard Associates, stood out. The citation was for "a commercial building whose historic character has been recaptured while manifesting the highest standards of restoration." Architects of record are di Domenico + Partners, with other firms and names also honored. From the brochure-photo, it looks like a two-story brick and glass-windowed structure proudly standing beneath the Historic Elevated Tracks & station-platform. The Muni Art Society’s MASterworks Awards were sponsored by HELABA, Landesbank Hessen-Thüringen. As East German Thuringia was—before November 1989—only one state in a Warsaw Pact Nation, its state-bank has certainly come a long way since then. Maybe it already had branches in West Germany, in several of the various fractions of Historic Hesse, such as Hesse-Darmstadt? In fact, have you noticed how many new Manhattan construction-projects have been financed by major German banks? Apparently, they have money, metaphorically, to burn? But whatever happened to the Grand Old Tradition of America and Americans financing their own projects, building their own buildings, and managing their own facilities? Where, how, and why did we begin to neglect doing these things for ourselves? Of course, this has absolutely nothing to do with the White House-inspired decision to permit a Dubai firm to take over management/control of the Port Authority—which not only owns Ground Zero, but also LaGuardia and JFK Airports. Actually, Dubai now boasts some of the most spectacular new buildings in the world. Some Arabs must be doing something right? Maybe the Arab Emirates can rebuild the World Trade Center, if Locals cannot make up their minds what should be done and how and when?